Ok so, the wife and I had just crossed the bridge over Cold Creek, and were heading uphill to the Junior Loop meadow when I pondered aloud whether or not I’d done a review of Goodrich Loomis CA. She pointed out that “GL” was such a well known, easily found, and well documented (we assumed) CA, that it wouldn’t warrant a “2oldguyswalking” review. Surely such a diverse and lovely CA would be well covered by everybody and their brother on the I’Net. This is one of the few times I don’t mind being wrong. I Googled for reviews and found about half a dozen. 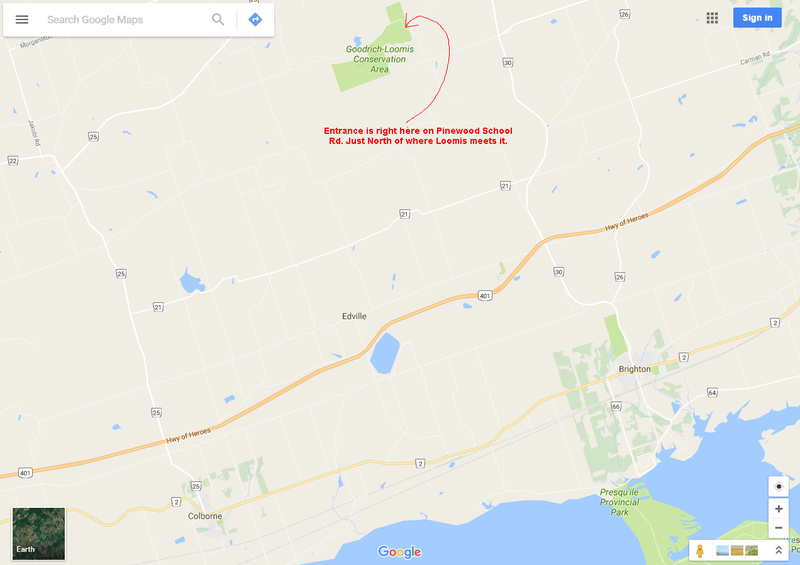 The first was a Lower Trent Conservation Authority site (who is responsible for the existence and maintainance of the CA). The LTCA site listed a very few facts about the twelve kms of six loop trails in the CA. The remaining five trail review sites were some of the finest examples of blatant plagerism as I’d ever seen. Though one couldn’t even get the number of trails right and another could get neither their number, nor their total distances right. So, I guess Goodrich Loomis is ripe for a 2oldguyswalking review despite it’s obvious attributes (and obvious presence on any map). Where to begin ? Well, I should point out that alot of GLCA is pretty damp and in the Summer months it becomes “Mosquito Nation”. So the Autumn, Winter, and Spring are the best times to visit, unless you wanna bathe in deet. As mentioned above, there are six trails. The North View trail (across the street, Pinewood School Rd, from the parking lot) is fairly easy walking through mostly pine forest, some mixed, and it borders a meadow. It’s pretty plain walking unless you’re looking for morels in the Spring. It’s also high and dry so you won’t have to fuss with bugs for it’s 1.9 kms. OK, I have no idea why they spun this map around so that what anyone looking at it would call “North” is actually South-West (check the compass). The rest of the trails are West of the parking lot and begin to differ in nature due to their elevation and proximity to Cold Creek. The Junior Loop is called the Junior Loop as it’s easy walking and only a 1.2 km trail. The Pine Loop trail winds through rich upland woods without much to challenge a walker for it’s near 2km distance. There’s a conveniently placed lean-to just over the bridge to this trail from the Junior Loop for a rest-up or a snack (we celebrated Ranger’s 65th birthday on the picnic table in that lean-to). Partridge berry patches were heavily berried when we walked here recently. Then … there’s the Beaver Trail. This is where things start getting a little different. The North View, Junior, and Pine Loop trails are all fairly dry and wide enough for as many as four to walk side by side. The Beaver trail starts to get rather wet and the trail becomes single file as the cedar root trip hazards increase with each step. Watch the boardwalks here as they can be quite slippery when wet (which they often are as the Creek is only a few meters away for most it’s length). Mind you, in the Spring and Fall, the mushroom displays on this trail can be spectacular. This is the first and only place I’ve ever seen earthstar mushrooms. The Loop D’Loop trail can be rough in that, there are some steep hills to climb (both up and down). At least the last half of the trail is wide enough for as many as four to pant, gasp, moan, and lament the failure to bring a granola bar. These 2 km felt like a fair bit more than that on the way to the Esker trail. 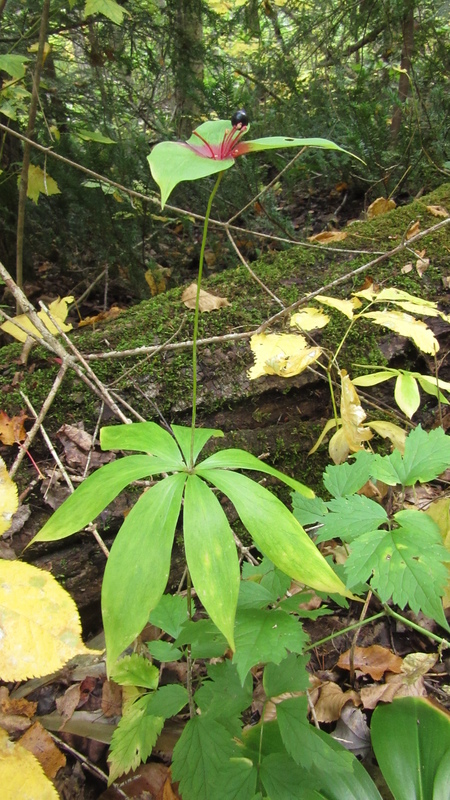 Mind you, we spotted a patch of rarely seen cucumber-root on this trail. That makes a total of three patches I’ve ever seen. 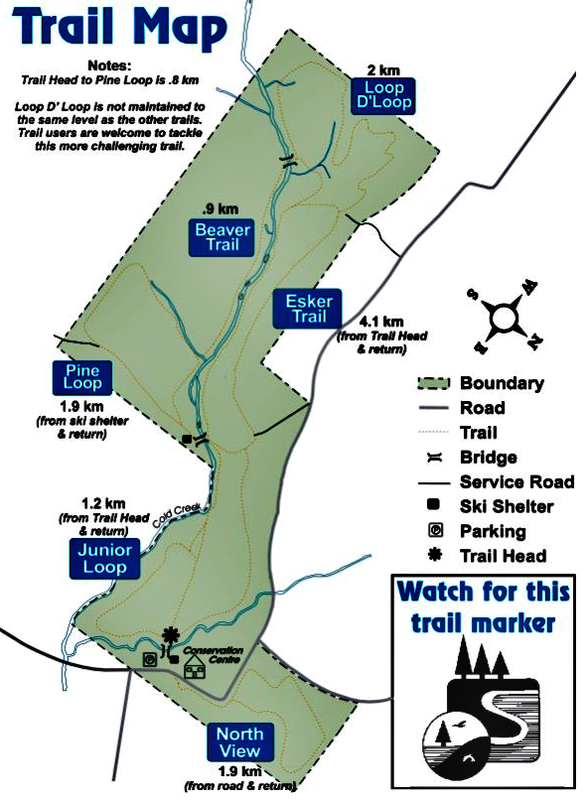 The Esker trail has a coupla “ups and downs” as well, but they’re more tolerable. It’s also wide and clear footed. The wife and I encountered a rather large turtle up on this trail a few years ago. I was embarrassed to be tired when I considered how much effort a climb up to that trail from the river below would’ve been for that poor reptile. As well, this trail offers an elevated view of Cold Creek. This CA has much to offer. Though it has six loop trails, five of them can be interconnected to provide a very long stroll through widely varying landscapes. There’s a year-round creek where fishing is allowed (according to the LTCA’s website), though we’ve never seen anyone fishing, and the few reviews posted by anglers say the fish are difficult to catch. There are alot of boardwalks, but watch them in wet conditions, particularly the corrugated cedar log ones. The wife loves bridges, and there are three of them here. It seems the further West you take the trails, the rougher they become. That stands to reason since the parking area, main picnic area, and Conservation Center are on the East end of the property.However, don’t take that as criticism, nor as a warning to avoid the wilder trails to the West. The wilder the trail, the rarer stuff you’re likely to see, and none of them are hazardous or ignored. There are many picnic sites, with the most being near the parking lot and Conservation Centre. There are also washroom facilities. I can’t vouch for whether they’re accessible in the Winter for skiiers, though I kinda doubt it.